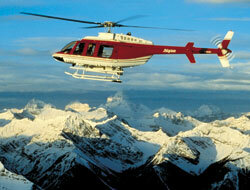 Take a helicopter flight over snowy Canmore and the Canadian Rockies. These tours are excellent especially for guests staying in Canmore as the helicopter base is in Canmore so you don't have far to travel! There are plenty of photo opportunities on this helicopter tour which is the most perfect add-on to any ski holiday in Canmore. There are three popular helicopter tours to choose from! Please note that with all our tours, we can not guarantee rates until time of booking as fuel charges and other fees may be added. This sensational flight will transport you to "The Matterhorn of the Canadian Rockies", which rises majestically to 3,611 meters (11,870 feet) along the Great Divide. The surrounding glaciers and icefalls will astound you and capture your imagination. This is photographers dream come true. An experience you will not forget!